Since its founding in 1970, Nimlok has become a worlwide leader in solutions for the display and exhibition industry. Our extensive product range fills requirements from lightweight portable displays to custom modular exhibition stands and promotional displays. We founded the International Nimlok Network to provide service to our clients as they use our products around the world - an expanding network that is currently comprised of over 200 distributors in 45 countries. Principal manufacturing facilities are located in the United Kingdom, the United States and Canada. We offer clients free Stand Design Services. Using the latest digital technologies, our experienced design team produce unique, creative and practical designs to meet your needs. For clients with multiple show dates, tight budgets or time constraints, our comprehensive hire service provides quick, cost-effective solutions. We have built our business and our reputation on our ability to meet the display and exhibition needs of all our clients, large or small. We look forward to having the opportunity of adding your organisation to our list of satisfied customers. Nimlink combines the unique look and presence of a custom exhibition stand with the cost-savings only a modular system can offer in shipping, set-up, storage, transport and refurbishment. And Nimlink is easily reconfigured as illustrated by the stands below and opposite. Nimlok's highly flexible Information Display System features clips that twist and lock into panel frames, to snap panels easily onto upright tubes. Easylink easily reconfigures to meet changing exhibition needs. Simply add panels and your display expands to 6m or larger. Easylink panels are available flat or curved and come in a wide range of panel types for total flexibility. Compact pop-up displays provide maximum portability. A standard 3x3 frame complete with panels, magbars and lights will pack into a single wheeled case. 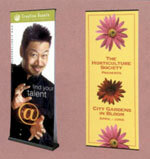 Nimlok's Banner Displays offer fast and easy solutions for point-of-purchase applications and instant presentations.